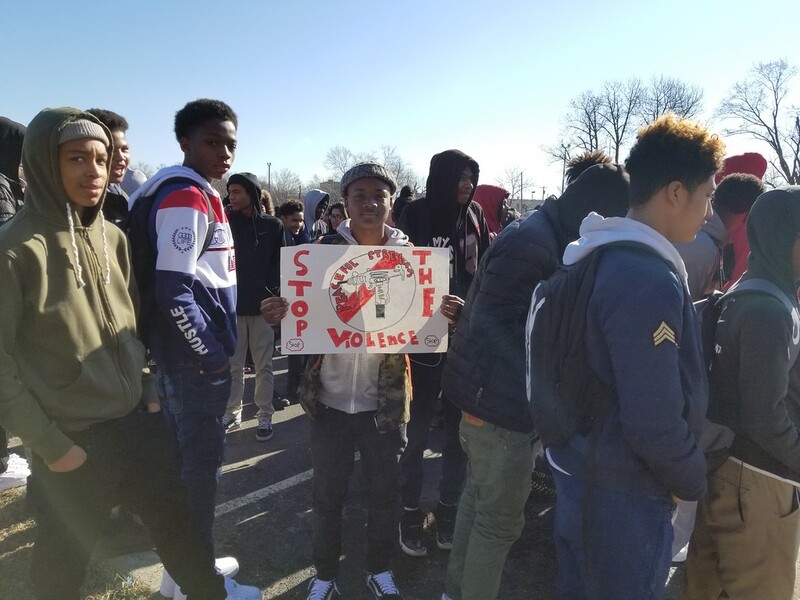 Chester High School students participate in the walkout. 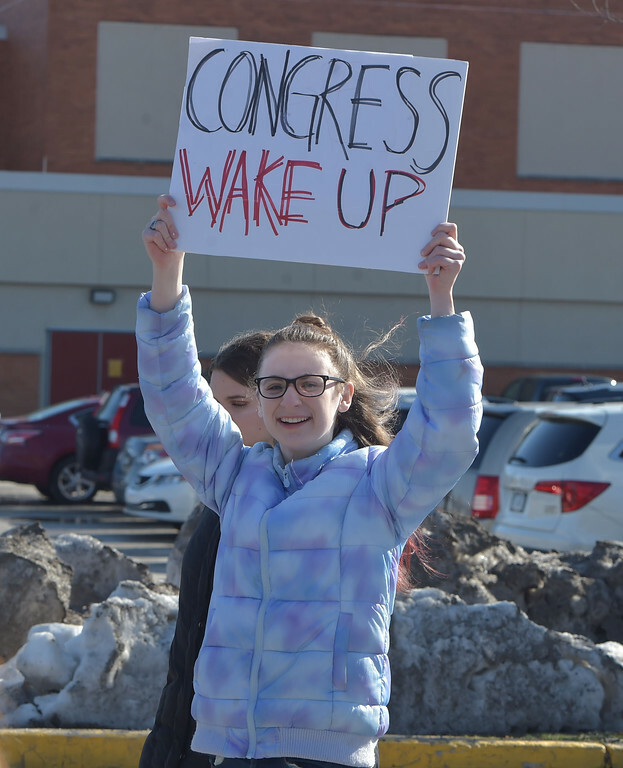 PETE BANNAN-DIGITAL FIRST MEDIA A Haverford High School student hold up a sign as she walks out of school to the Student Unity Rally held at Cornog Field Wednesday morning. 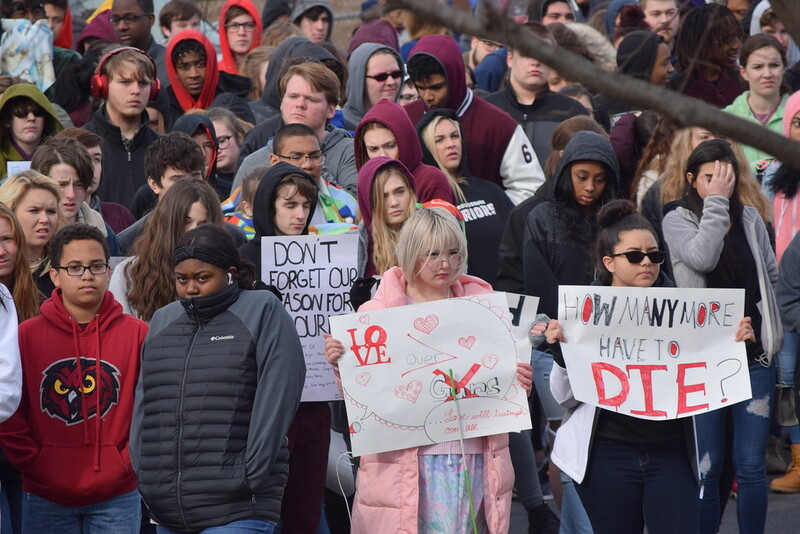 School officials estimated over 900 students took part, including walking around the track 17 times to remember the students killed in the Florida school shooting. They then held speeches and music before returning to classes. 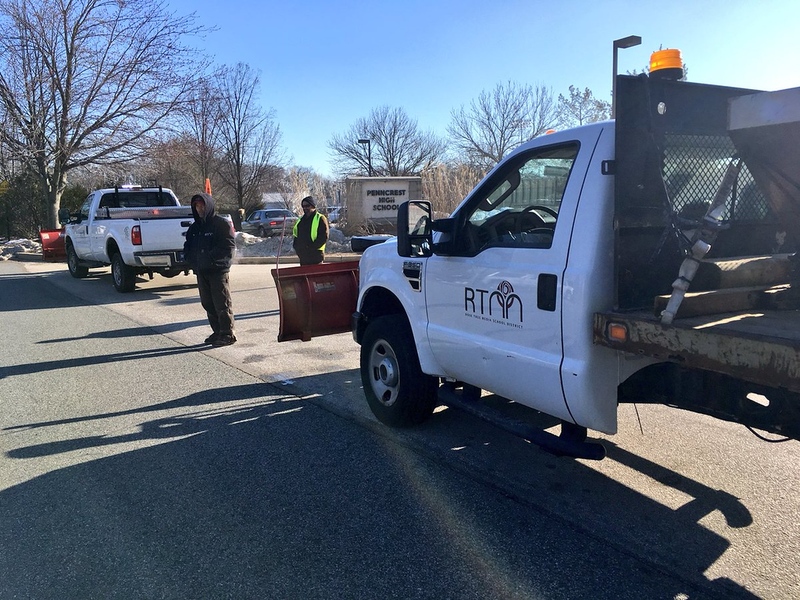 School officials said students organized the event while working with the adminstration. 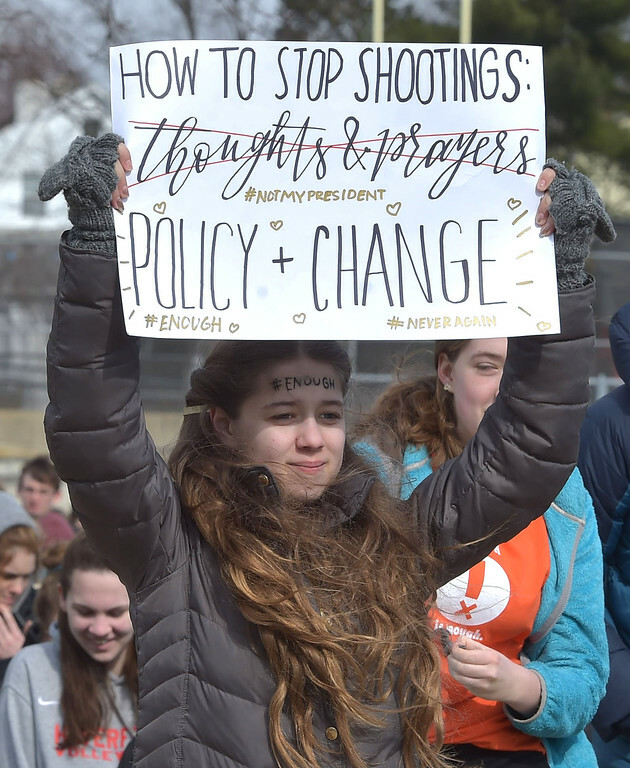 PETE BANNAN-DIGITAL FIRST MEDIA A Haverford High School student holds up a sign as he walks out of school to the Student Unity Rally held at Cornog Field Wednesday morning. 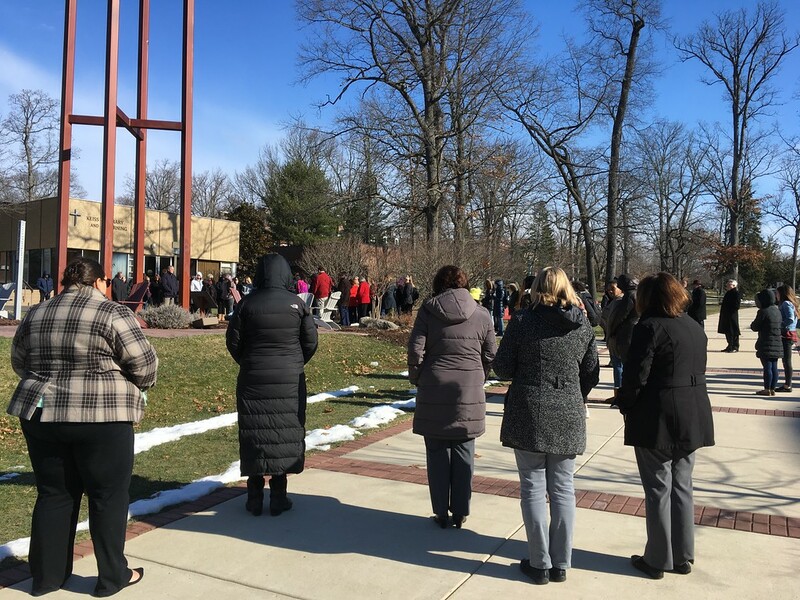 School officials estimated over 900 students took part, including walking around the track 17 times to remember the students killed in the Florida school shooting. They then held speeches and music before returning to classes. 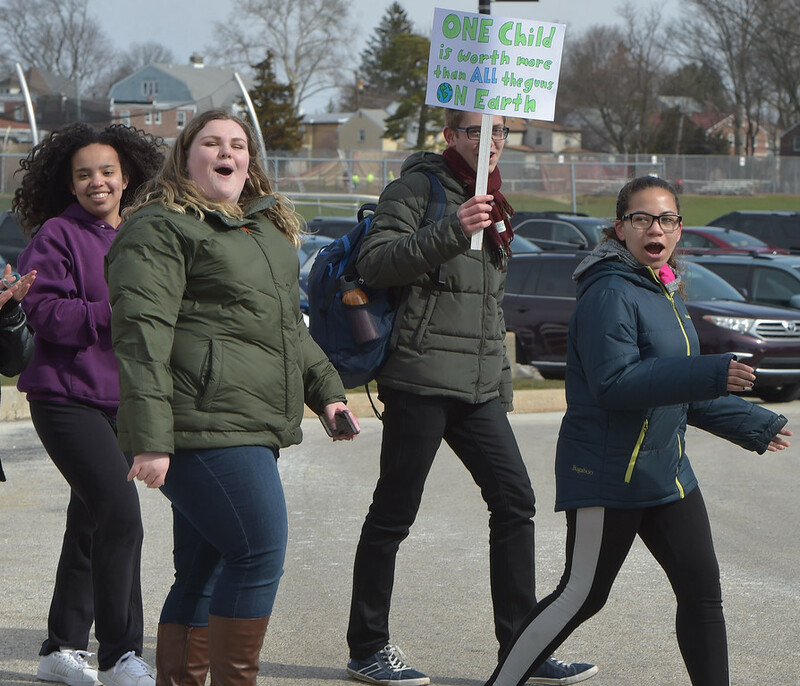 School officials said students organized the event while working with the administration. 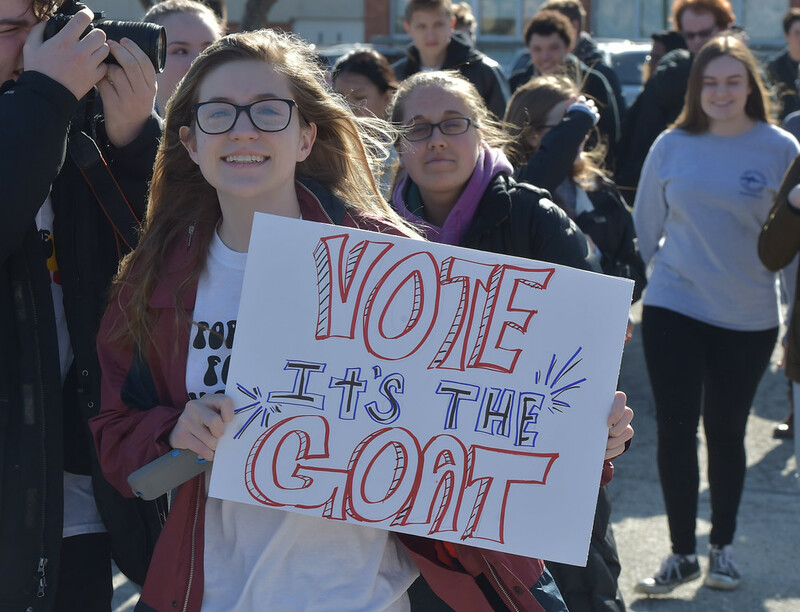 PETE BANNAN-DIGITAL FIRST MEDIA A Haverford High School student holds up a sign as she walks out of school to the Student Unity Rally held at Cornog Field Wednesday morning. 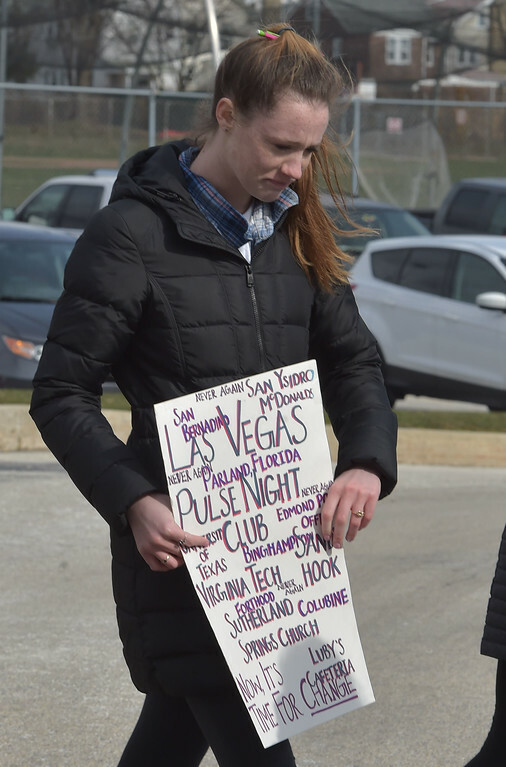 School officials estimated over 900 students took part, including walking around the track 17 times to remember the students killed in the Florida school shooting. They then held speeches and music before returning to classes. 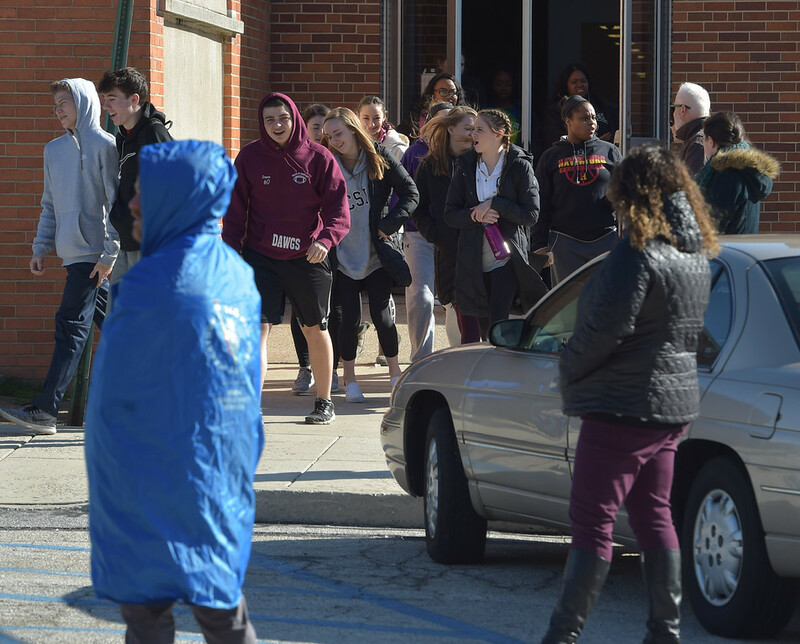 School officials said students organized the event while working with the administration. 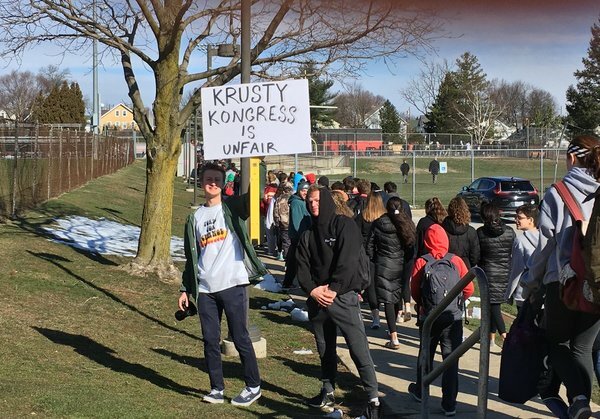 Lower Merion students protest. Photo by Linda Stein. 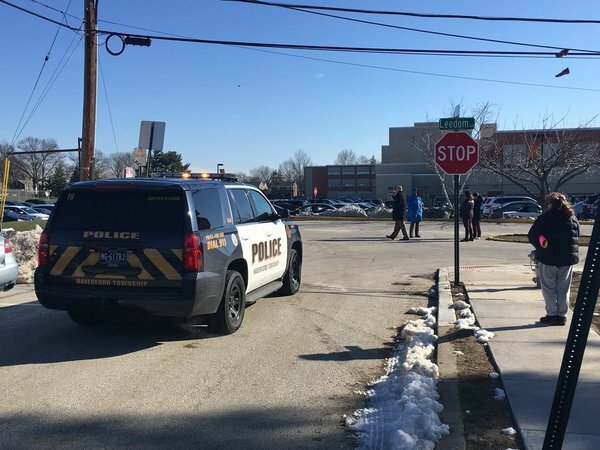 Police and others blocked access to Penncrest High School. 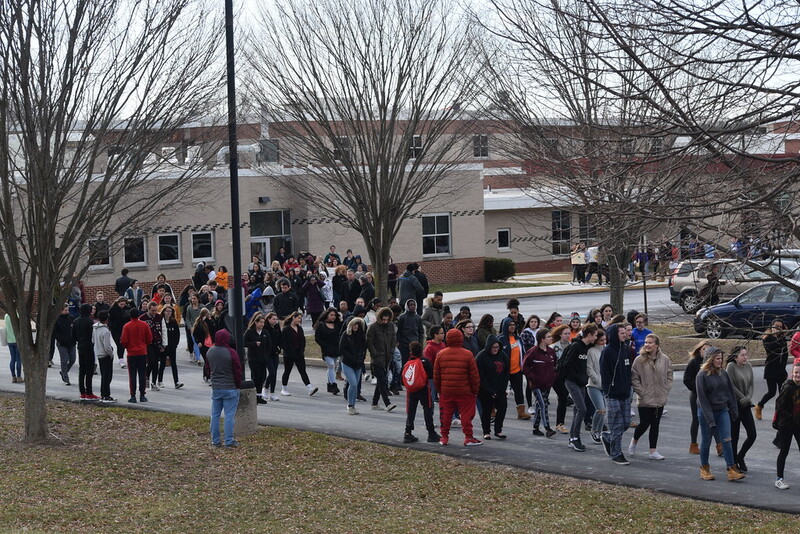 Lower Merion students march around the school. Photo by Linda Stein. 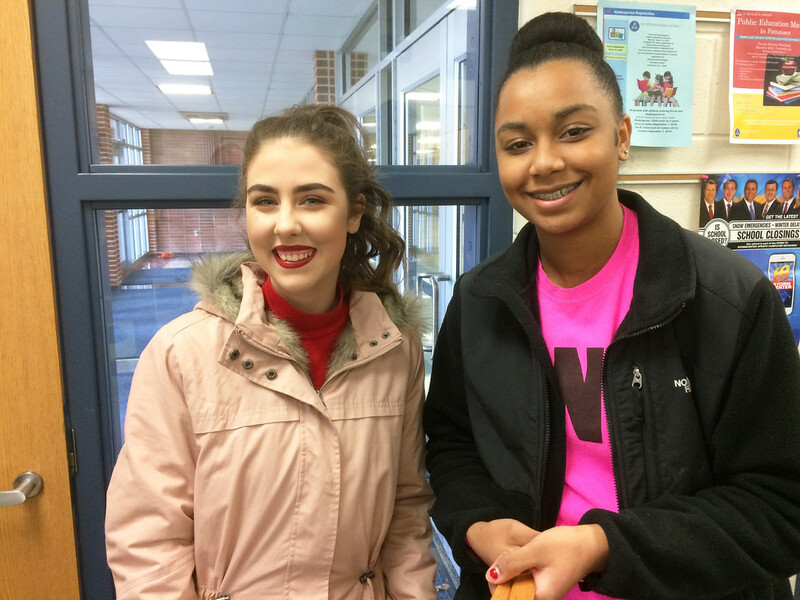 Evan Brandt -- Digital First Media Pottstown High School junior Emily Hart, left, and sophomore Mariana Pearson, helped to organize the student walk-out at Pottstown High School Wednesday. 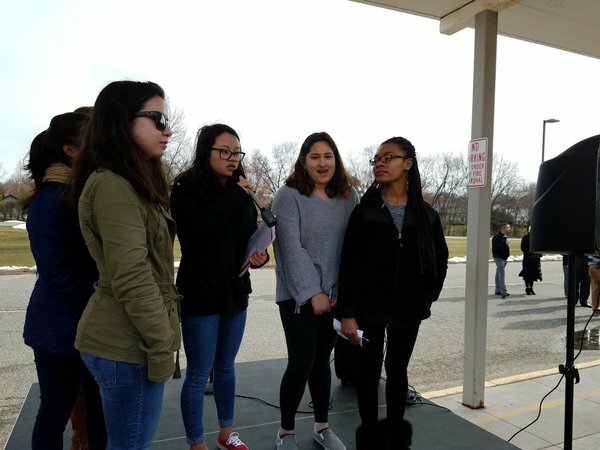 Photo Courtesy of Kate Erb Students speak at the walk-out at Owen J. Roberts High School Wednesday. 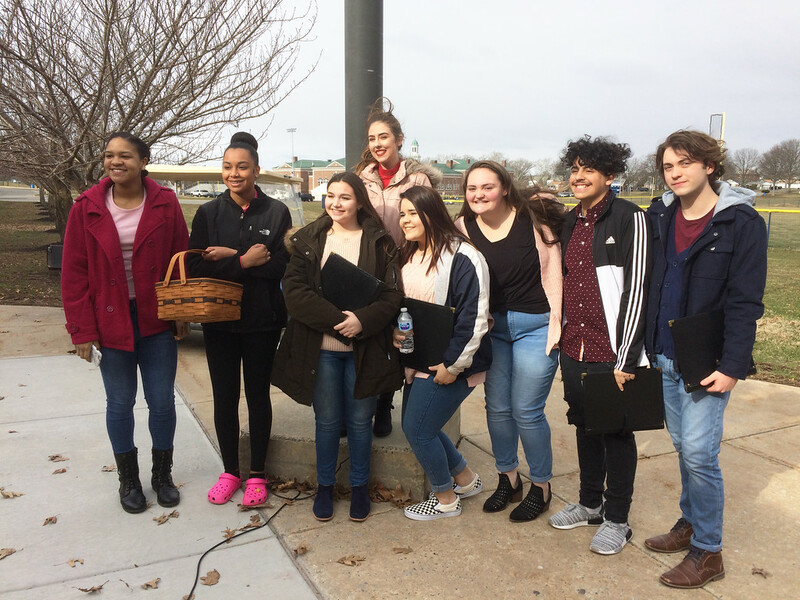 Evan Brandt -- Digital First Media Students gather outside Pottstown High School in advance of the walk-out ceremonies there Wednesday. 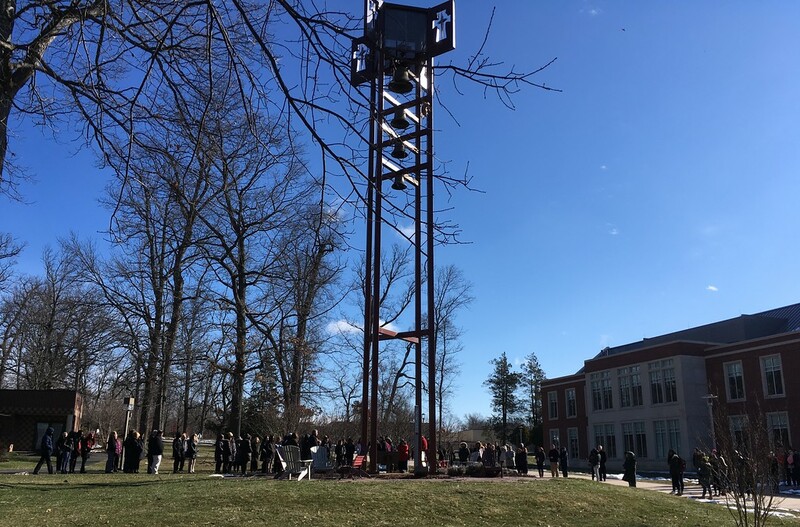 Evan Brandt -- Digital First Media Pottstown High School students gathered around the flagpole in front of the school for their walk-out Wednesday in recognition of those who died in the shootings at Marjorie Stoneman Douglas High School in Parkland Florida Feb. 14. 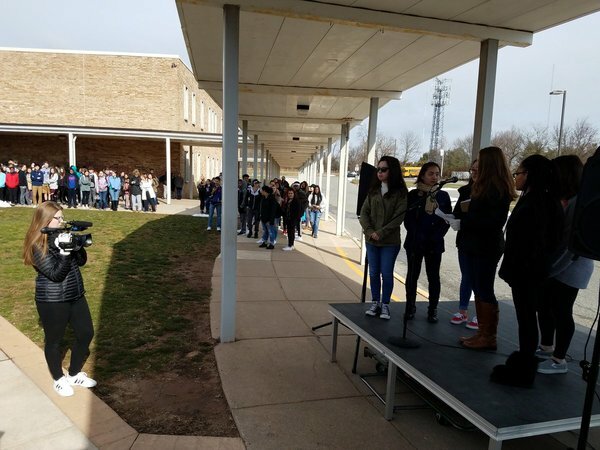 Evan Brandt -- Digital First Media Pottstown High School's a capella choir also sang at the walk-out ceremonies at Pottstown High School Wednesday. 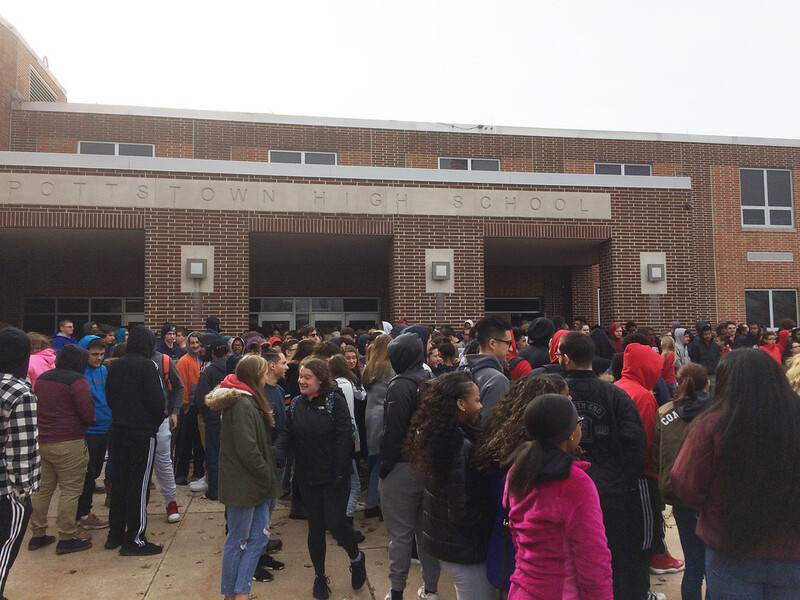 Evan Brandt -- Digital First Media Speakers address the Pottstown High School walk-out Wednesday. 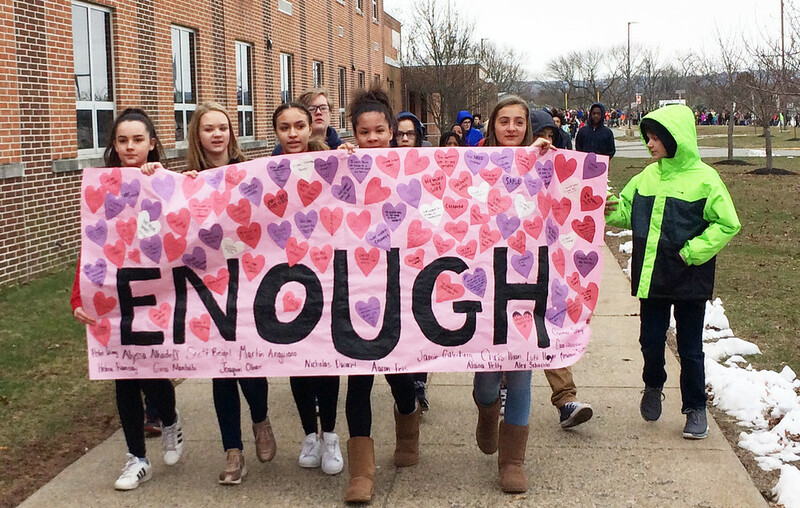 At left, are Pottstown Middle School students who walked over to the high school behind a banner that said simply "Enough." 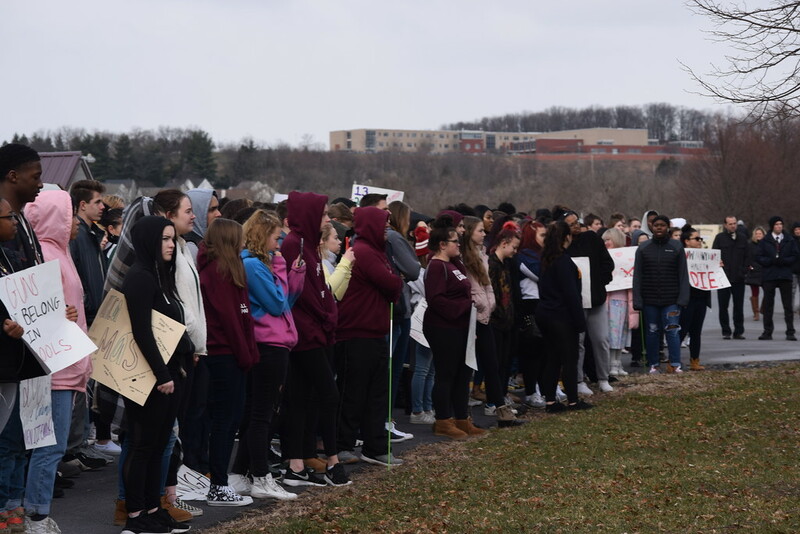 PETE BANNAN-DIGITAL FIRST MEDIA Haverford High School students walk out of school to the Student Unity Rally held at Cornog Field Wednesday morning. 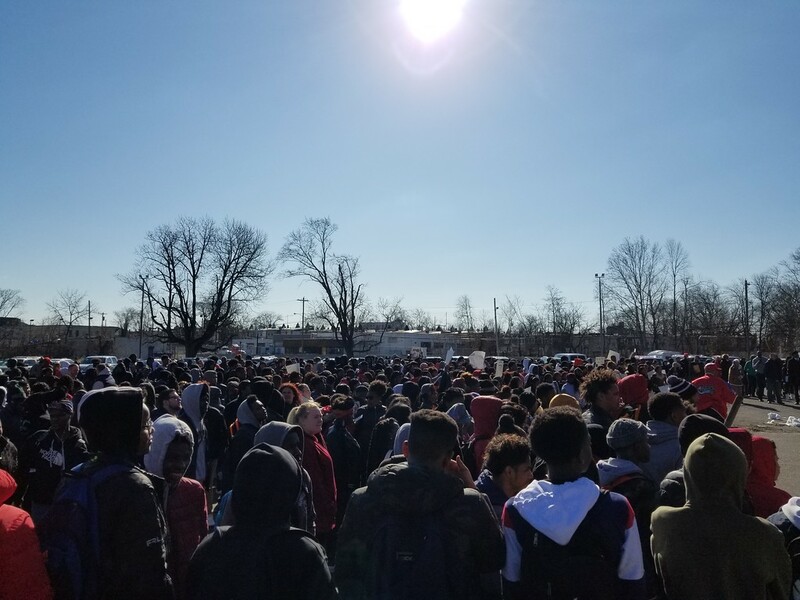 School officials estimated over 900 students took part, including walking around the track 17 times to remember the students killed in the Florida school shooting. 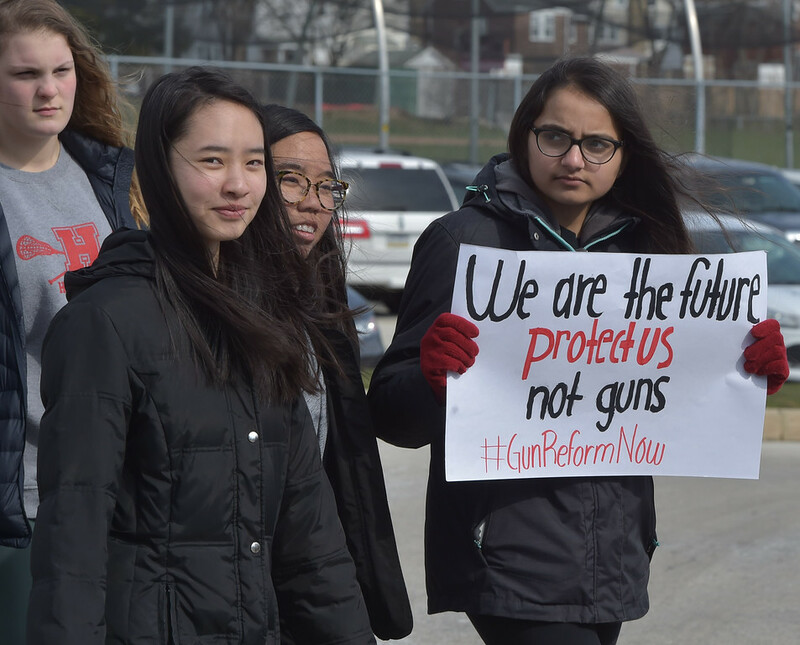 They then held speeches and music before returning to classes. 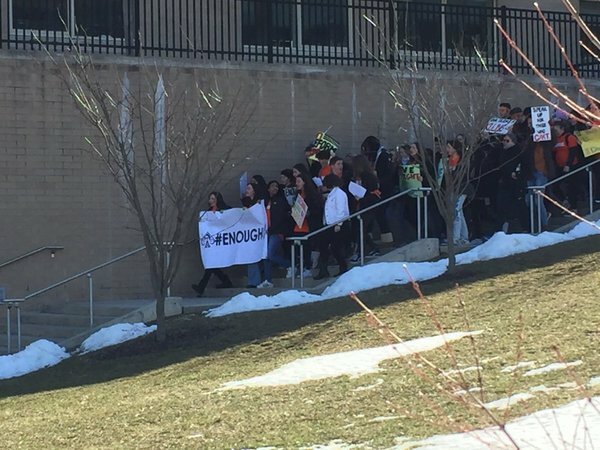 School officials said students organized the event while working with the administration. 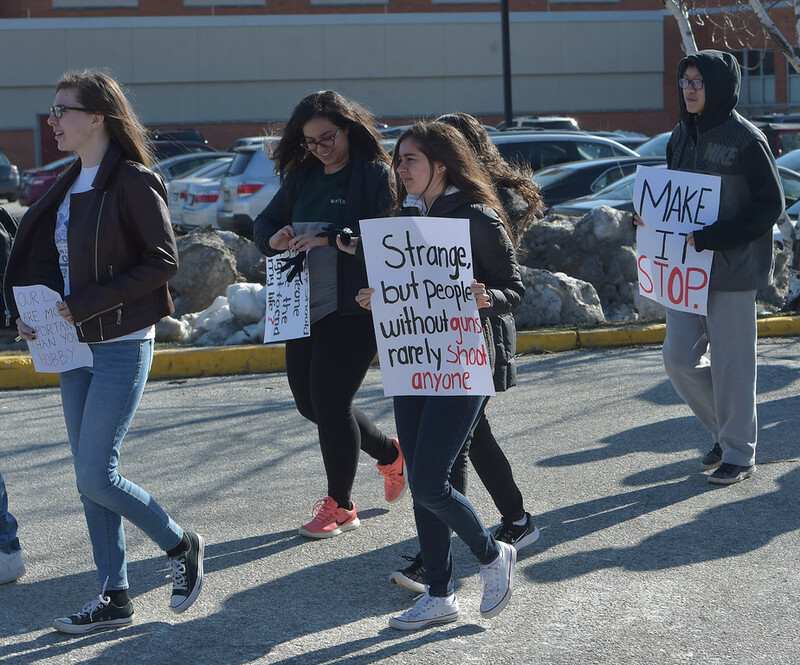 PETE BANNAN-DIGITAL FIRST MEDIA Haverford High School students hold up a signs as they walk out of school to the Student Unity Rally held at Cornog Field Wednesday morning. 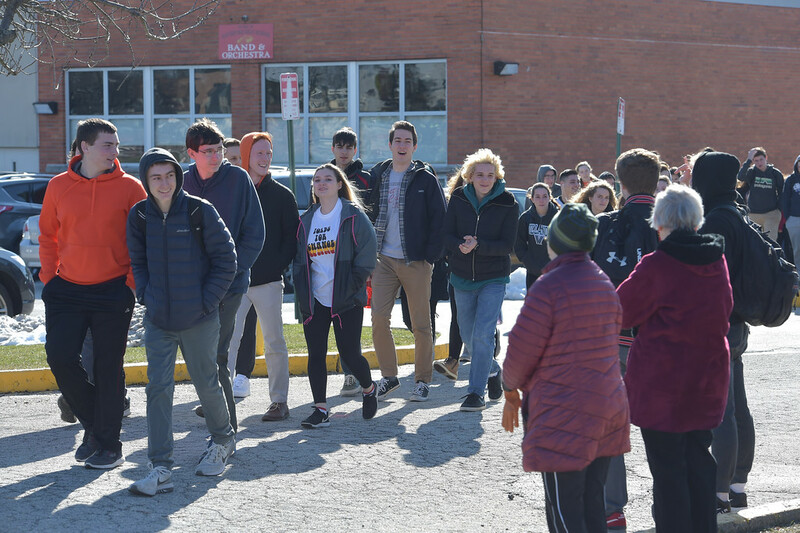 School officials estimated over 900 students took part, including walking around the track 17 times to remember the students killed in the Florida school shooting. 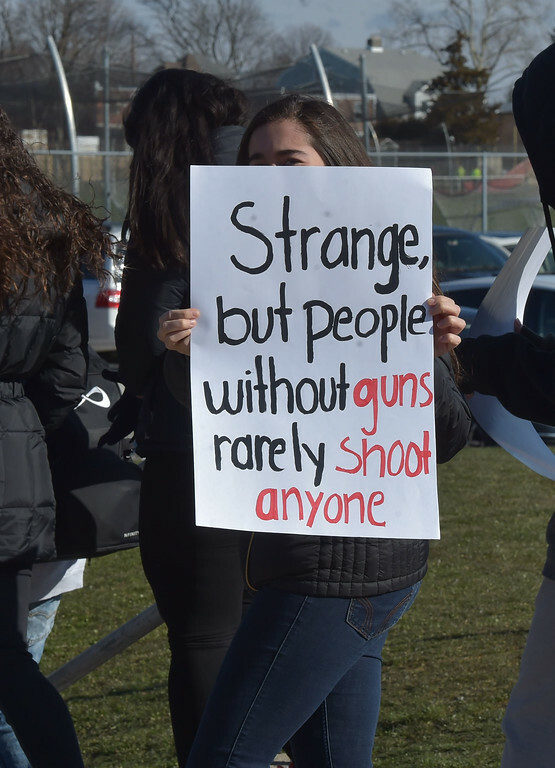 They then held speeches and music before returning to classes. 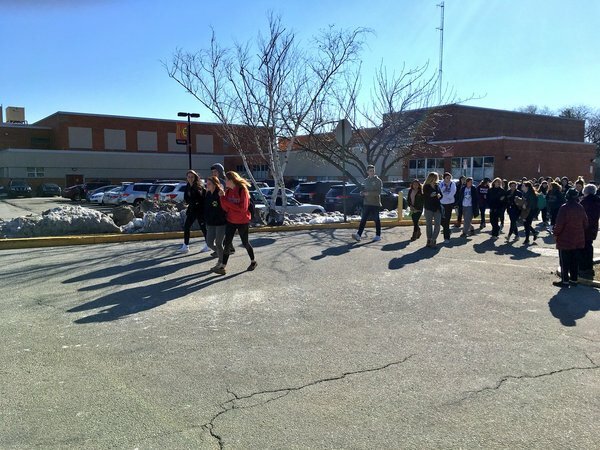 School officials said students organized the event while working with the administration. 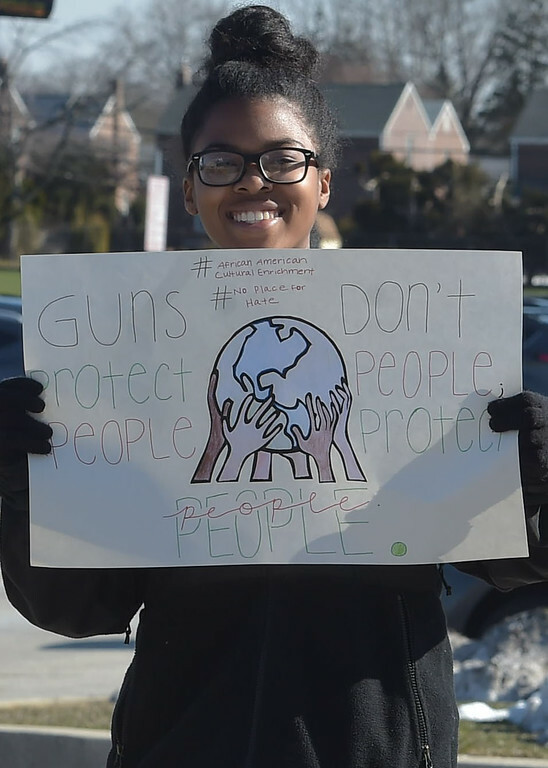 PETE BANNAN-DIGITAL FIRST MEDIA A Haverford High School student hold up a sign as she walks out of school to the Student Unity Rally held at Cornog Field Wednesday morning. 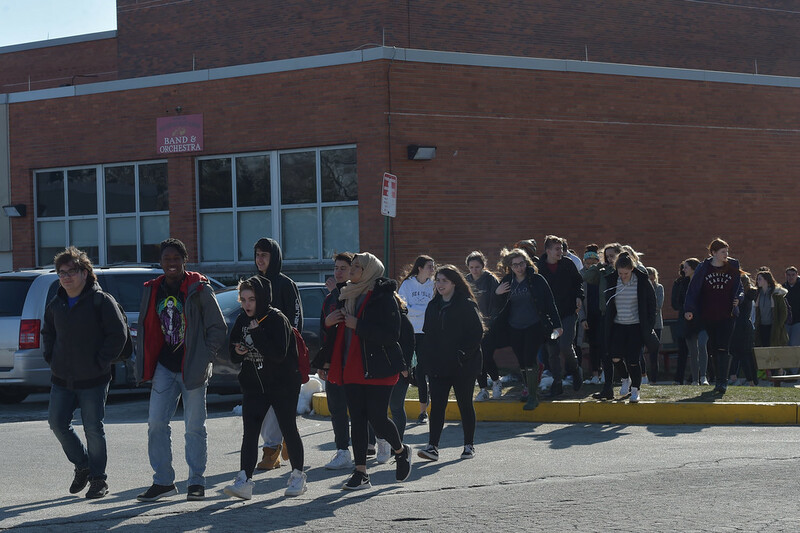 School officials estimated over 900 students took part, including walking around the track 17 times to remember the students killed in the Florida school shooting. 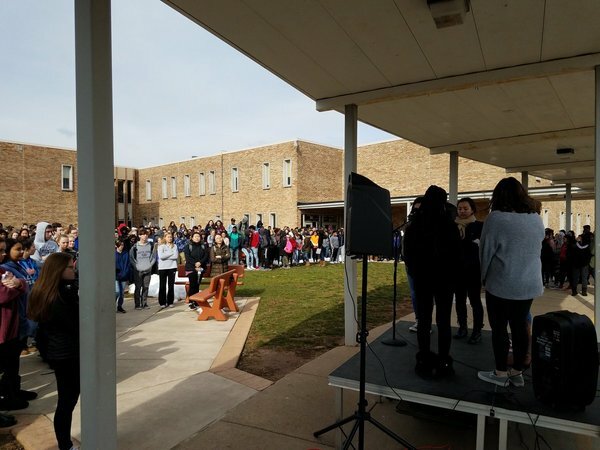 They then held speeches and music before returning to classes. 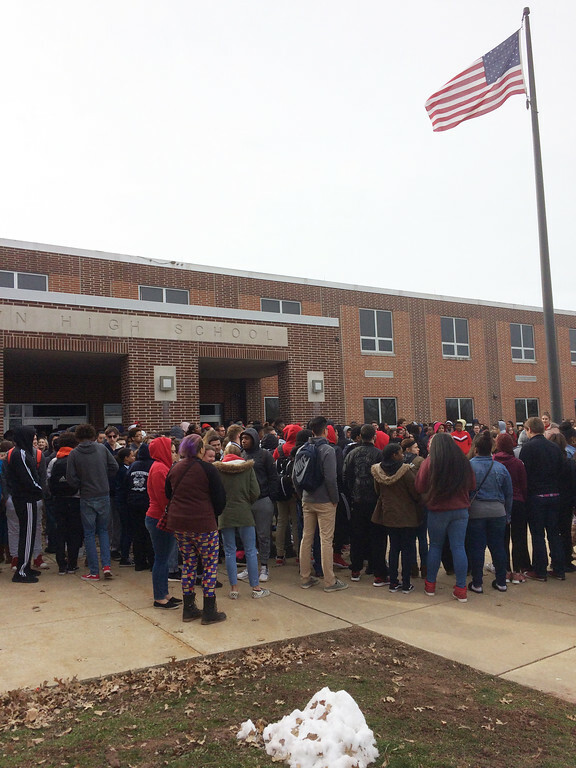 School officials said students organized the event while working with the administration. 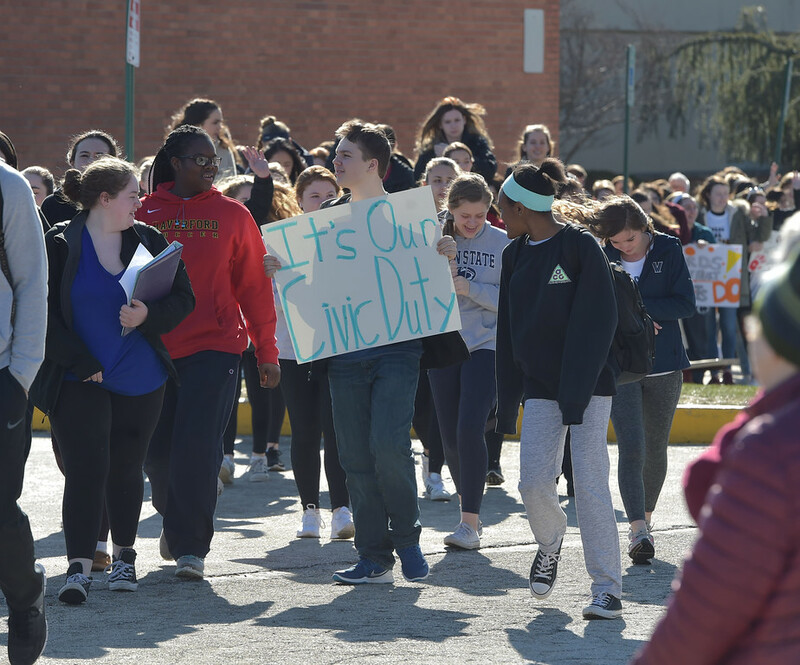 PETE BANNAN-DIGITAL FIRST MEDIA Haverford High School students walks out of school to the Student Unity Rally held at Cornog Field Wednesday morning. 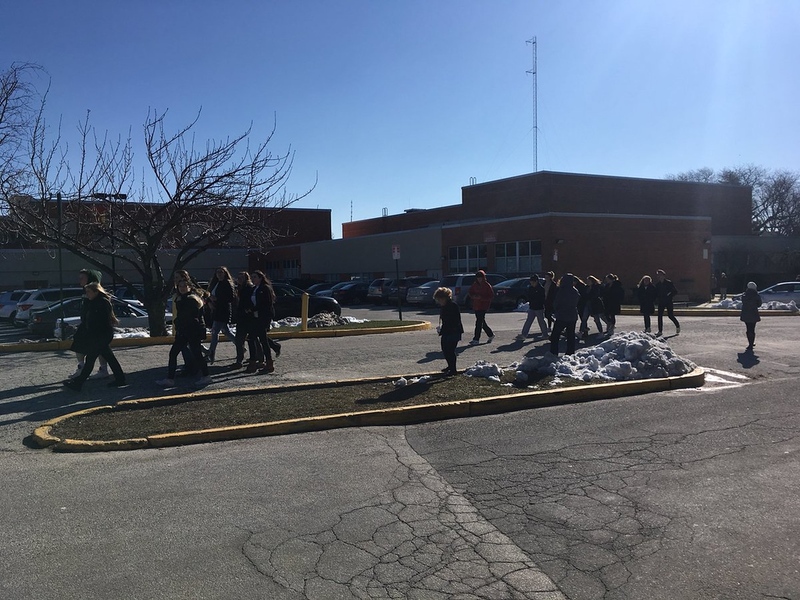 School officials estimated over 900 students took part, including walking around the track 17 times to remember the students killed in the Florida school shooting. 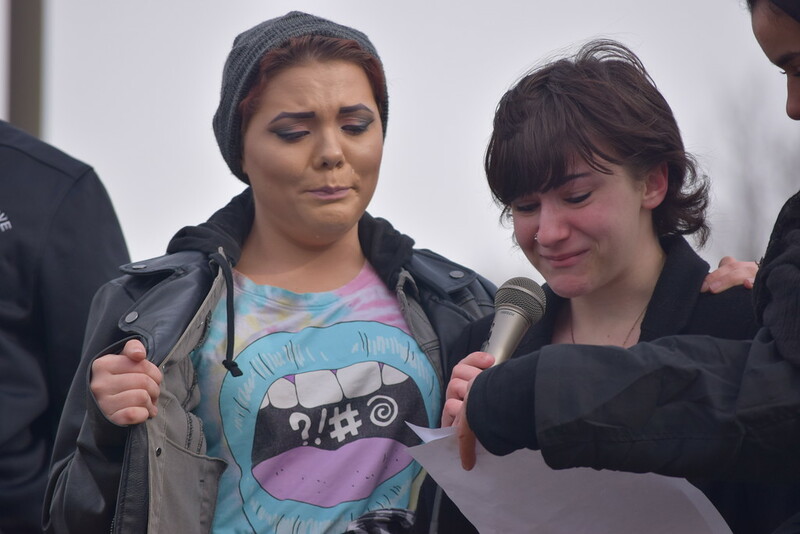 They then held speeches and music before returning to classes. 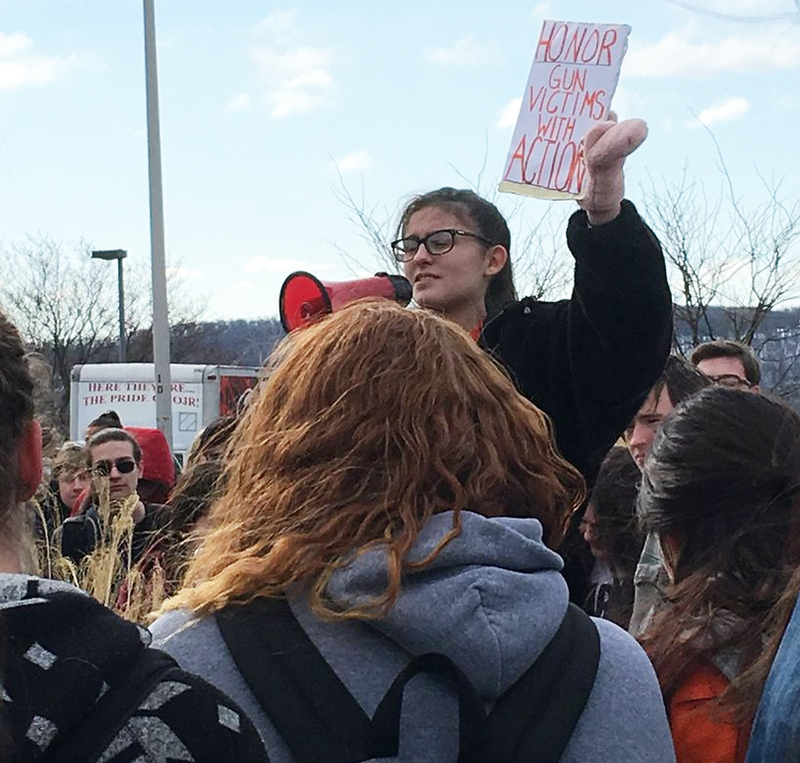 School officials said students organized the event while working with the administration. 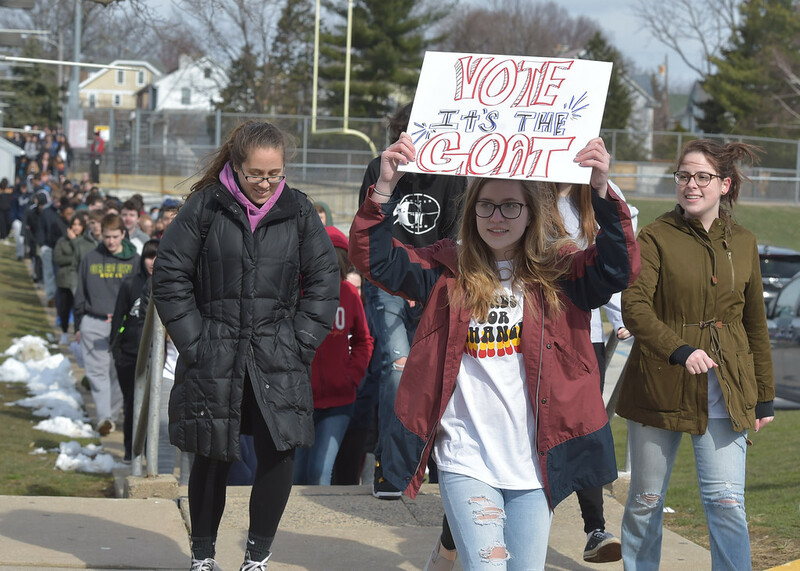 PETE BANNAN-DIGITAL FIRST MEDIA A Haverford High School student hold up a sign as she walks back to school from the Student Unity Rally held at Cornog Field Wednesday morning. 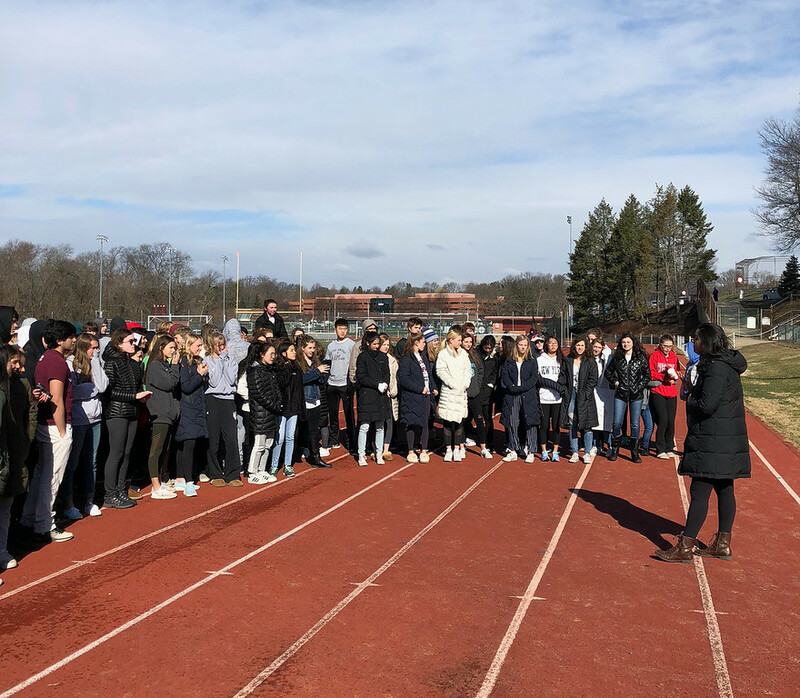 School officials estimated over 900 students took part, including walking around the track 17 times to remember the students killed in the Florida school shooting. They then held speeches and music before returning to classes. 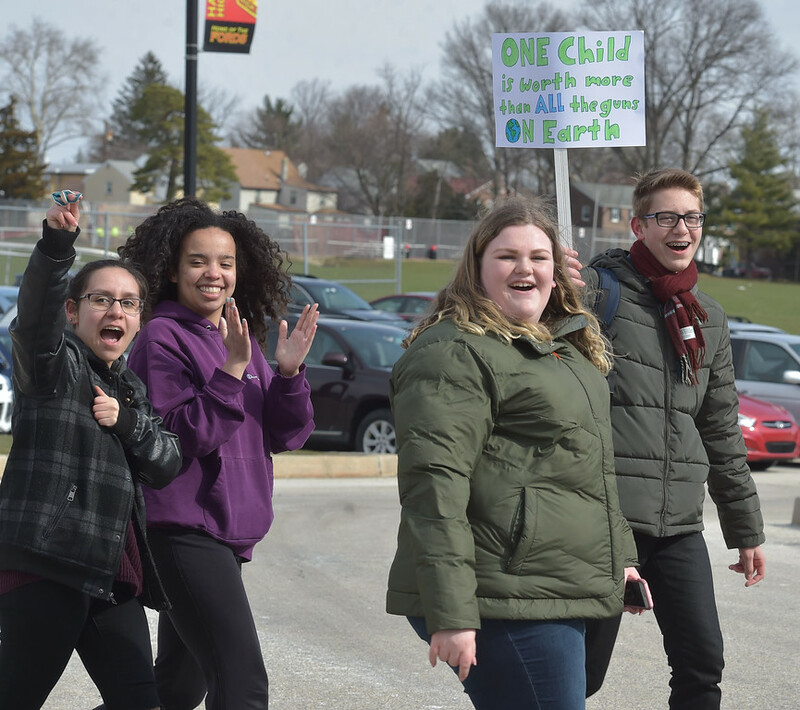 School officials said students organized the event while working with the administration. 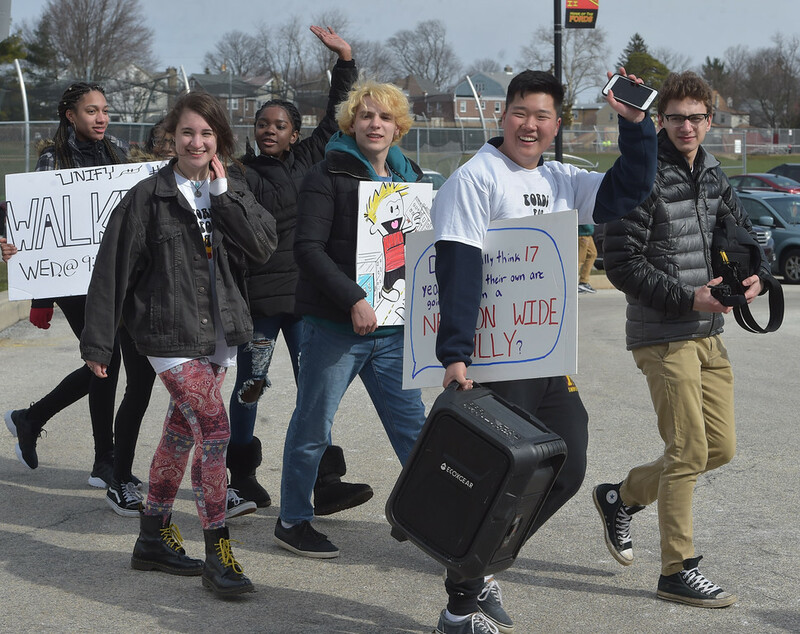 PETE BANNAN-DIGITAL FIRST MEDIA Haverford High School student return from the Student Unity Rally held at Cornog Field Wednesday morning. 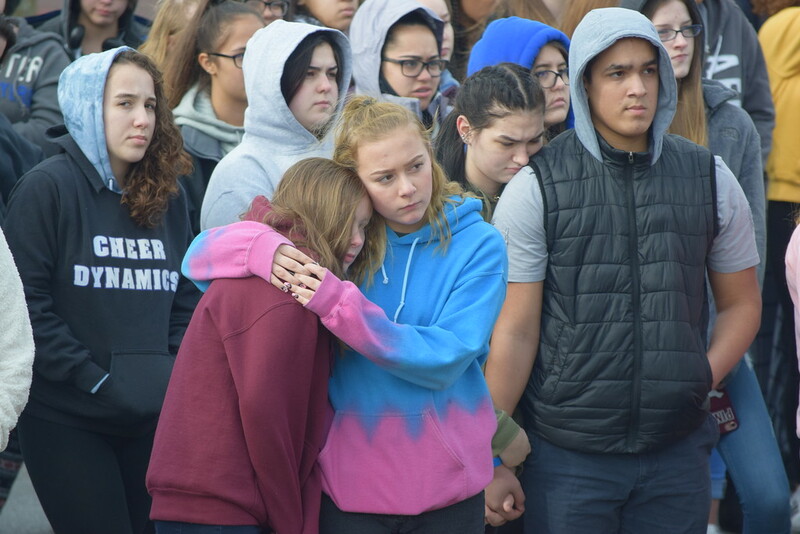 School officials estimated over 900 students took part, including walking around the track 17 times to remember the students killed in the Florida school shooting then held speeches and music before returning to classes. 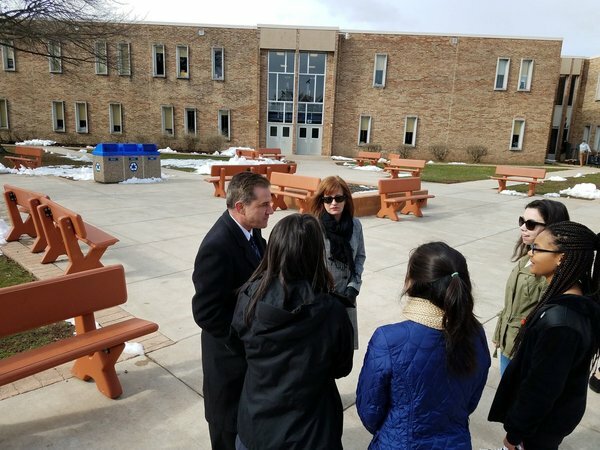 School officials said the students organized the event while working with the administration. 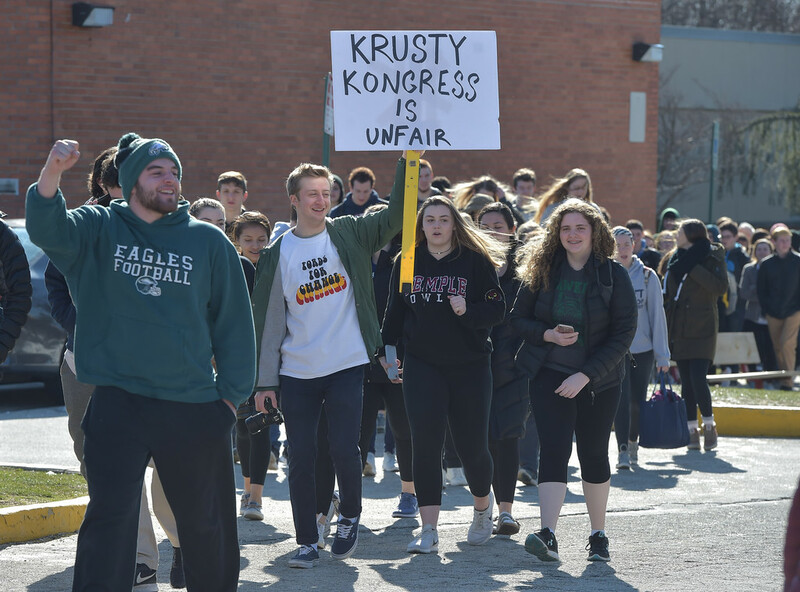 PETE BANNAN-DIGITAL FIRST MEDIA Haverford High School students walk of school to the Student Unity Rally held at Cornog Field Wednesday morning. 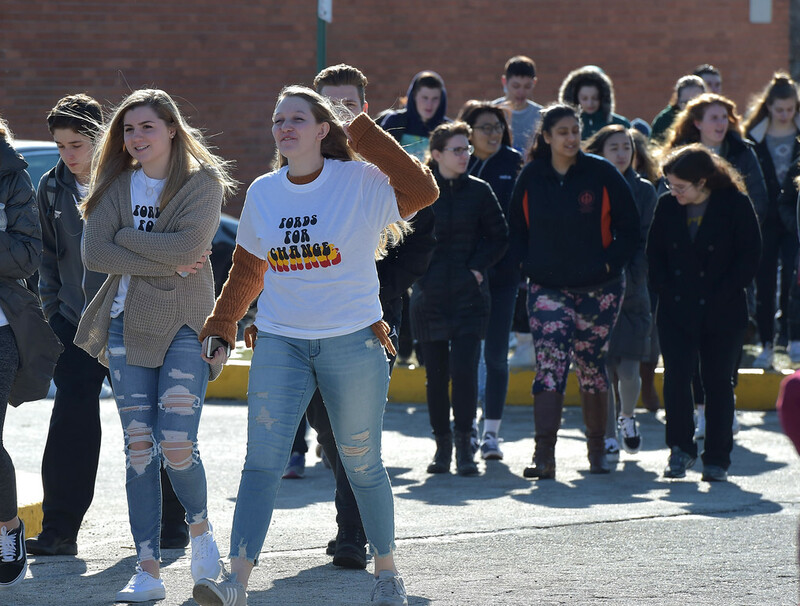 School officials estimated over 900 students took part, they walked arounf the track 17 times to remember the students killed in the Florida school shooting then held speeches and music before returning to classes. 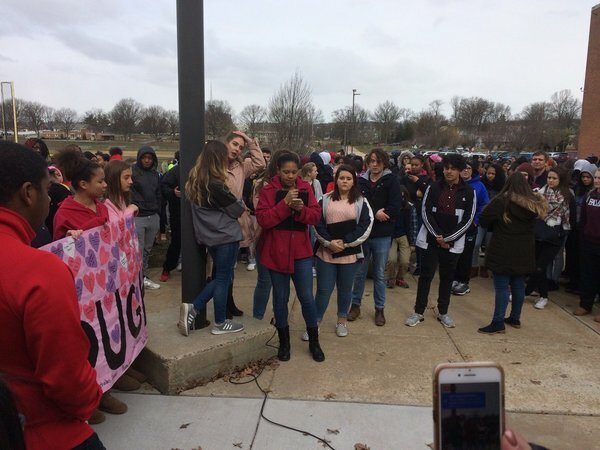 School officials said the students organized everything. 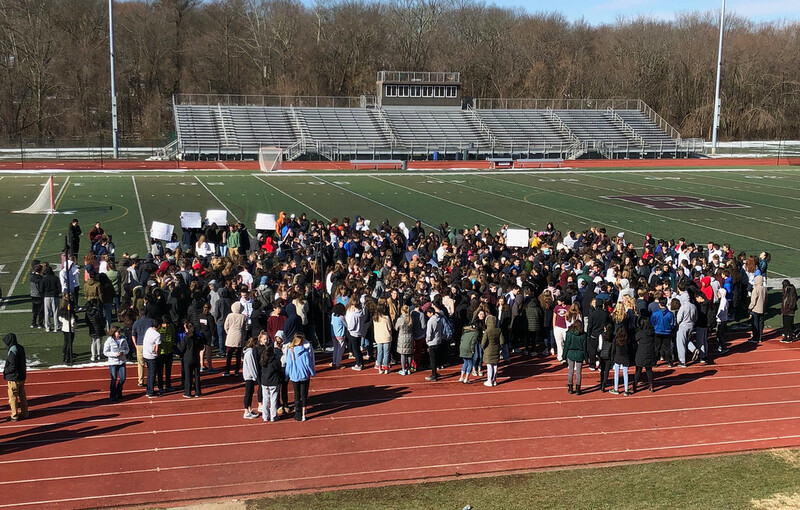 PETE BANNAN-DIGITAL FIRST MEDIA Members of the public gather to support Haverford High School students who walked out of school for the Student Unity Rally held at Cornog Field Wednesday morning. 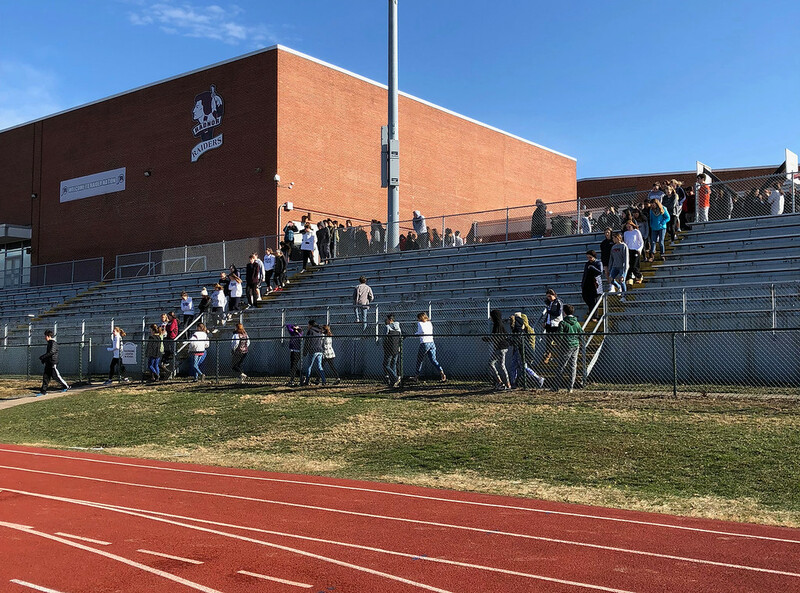 School officials estimated over 900 students took part, including walking around the track 17 times to remember the students killed in the Florida school shooting. They then held speeches and music before returning to classes. 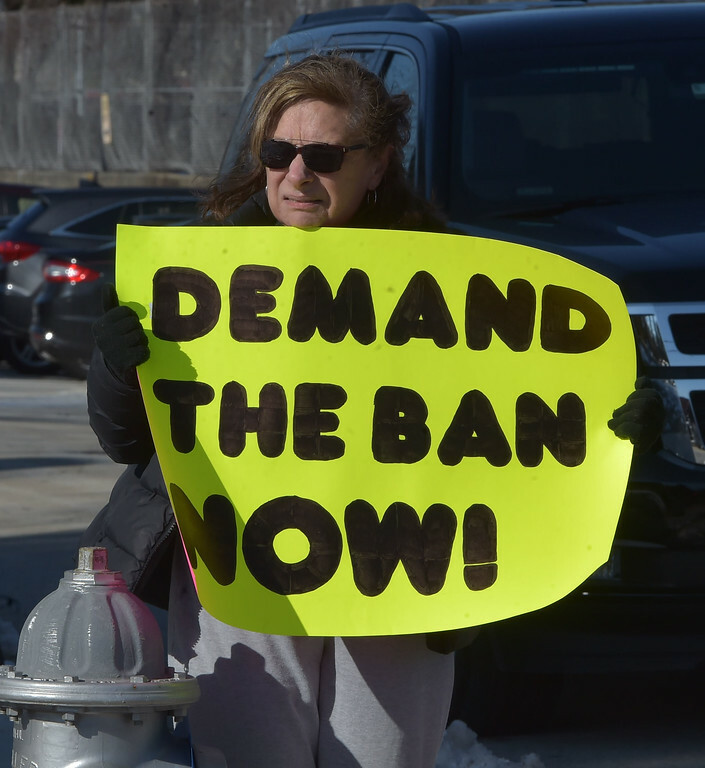 School officials said students organized the event while working with the administration. 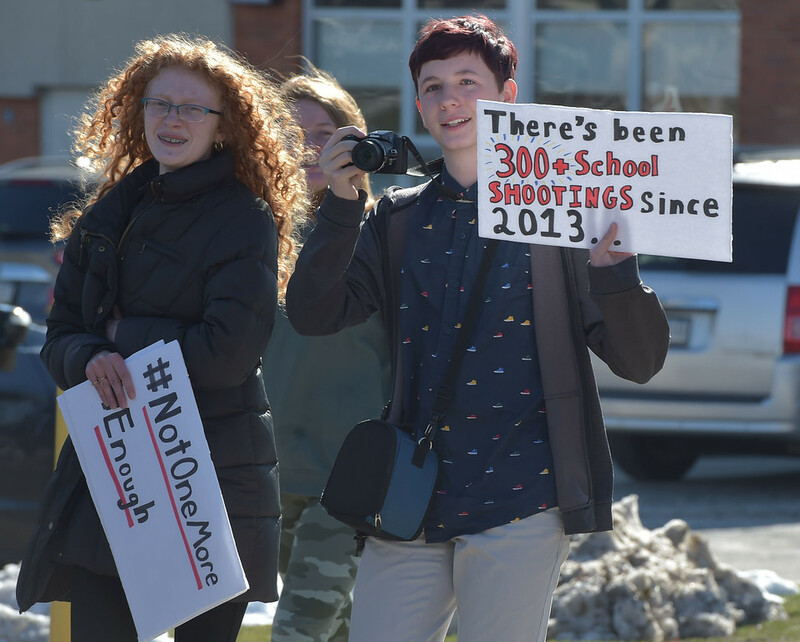 PETE BANNAN-DIGITAL FIRST MEDIA Elaine Vatre of Havertown holds up a sign in support of Haverford High School students who walked out of school for the Student Unity Rally held at Cornog Field Wednesday morning. 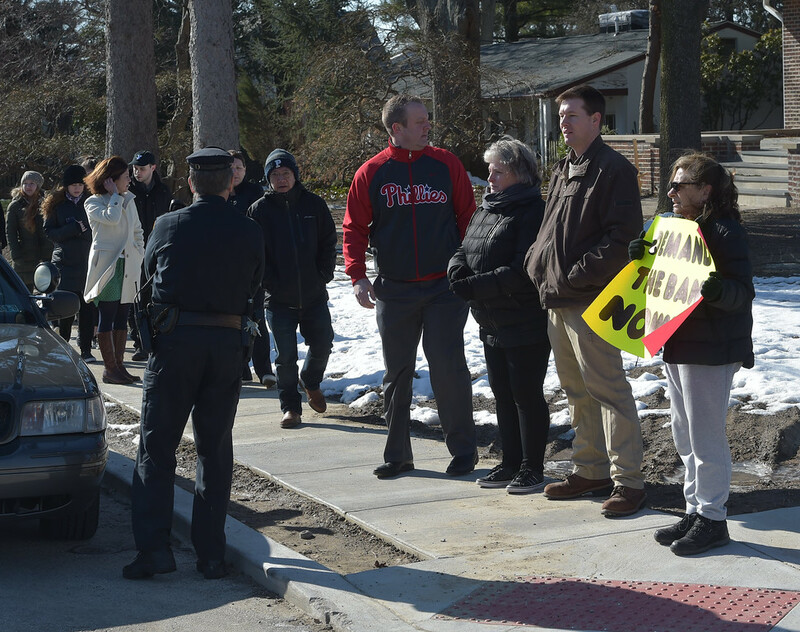 Vatre was one of about a dozen adults who stood across from the school in support of the students. 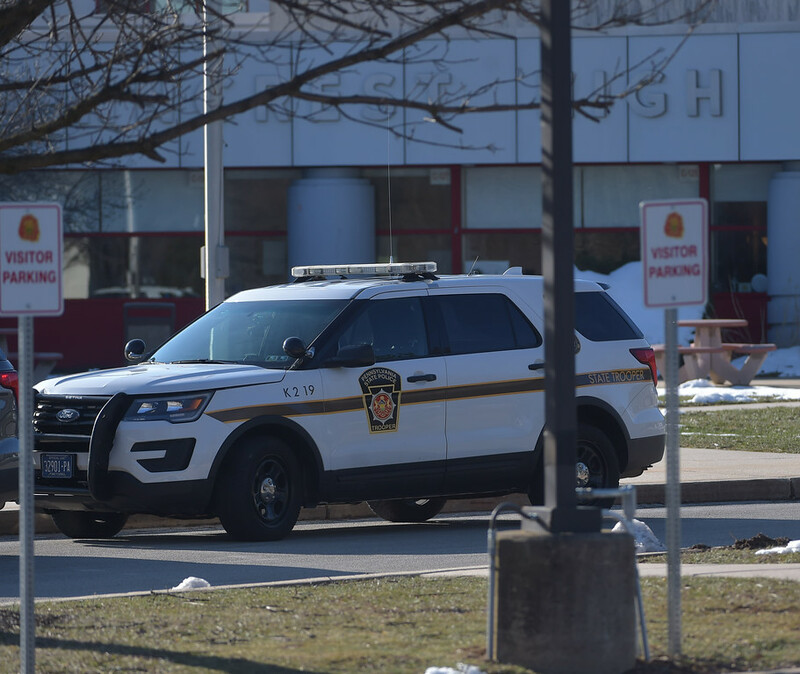 PETE BANNAN-DIGITAL FIRST MEDIA A Pennsylvania State police car outside Penncrest High School Wednesday morning. 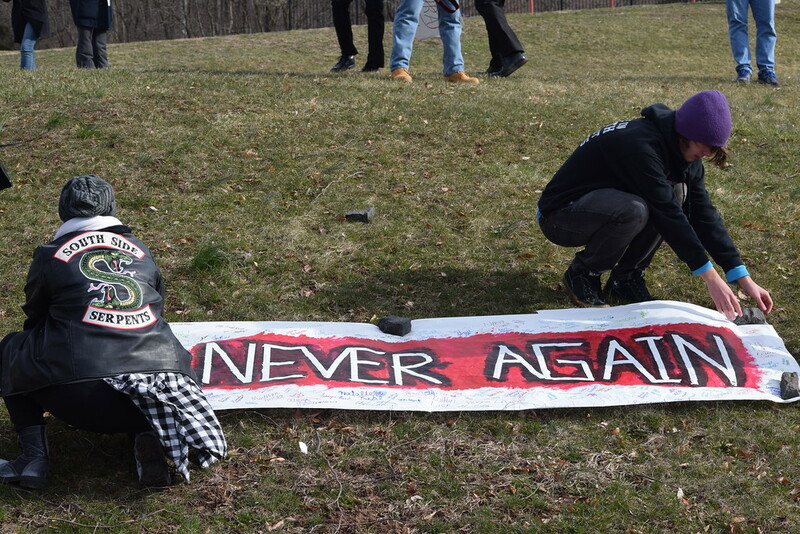 The campus was clsed during the student walkout. 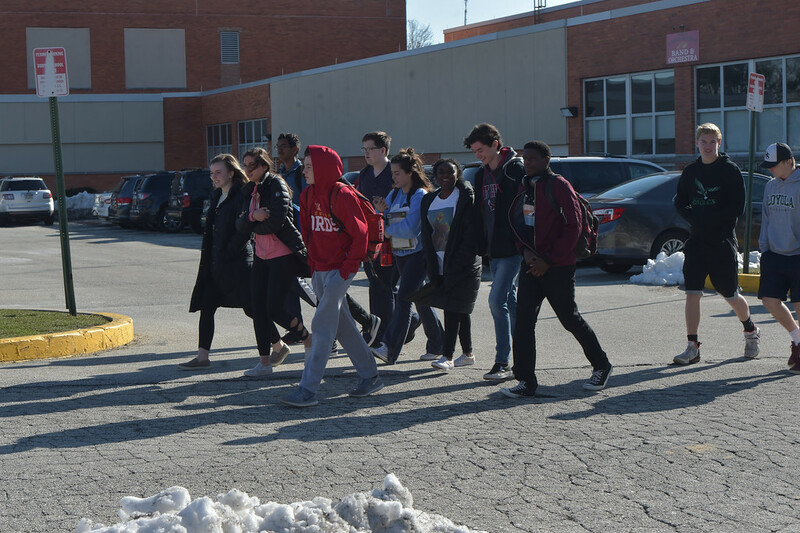 PETE BANNAN-DIGITAL FIRST Haverford High School students return from their Student Unity Rally held at Cornog Field Wednesday morning. 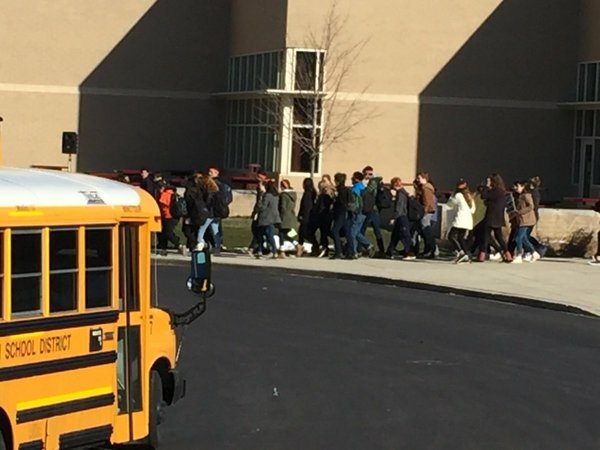 School officials estimated over 900 students took part, they walked arounfd the track 17 times to remember the students killed in the Florida school shooting then held speeches and music before returning to classes. 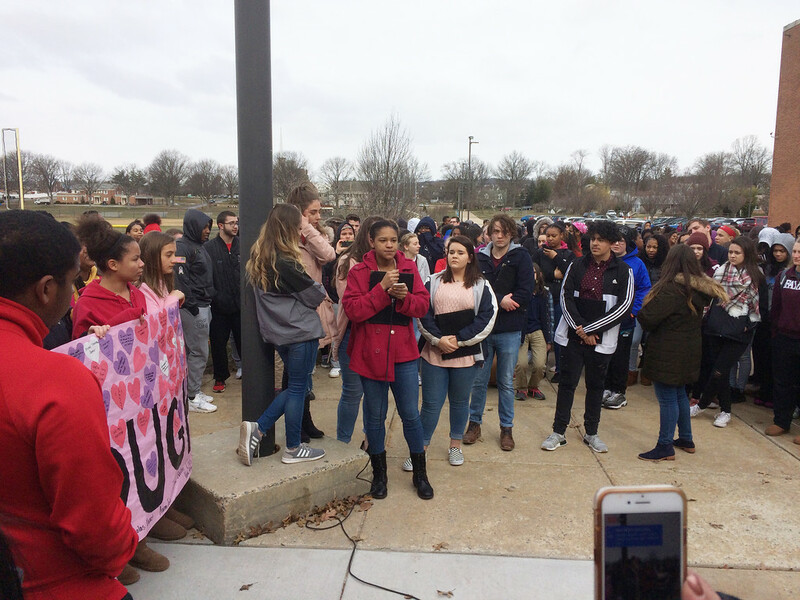 School officials said the students organized the event while working with the administration. 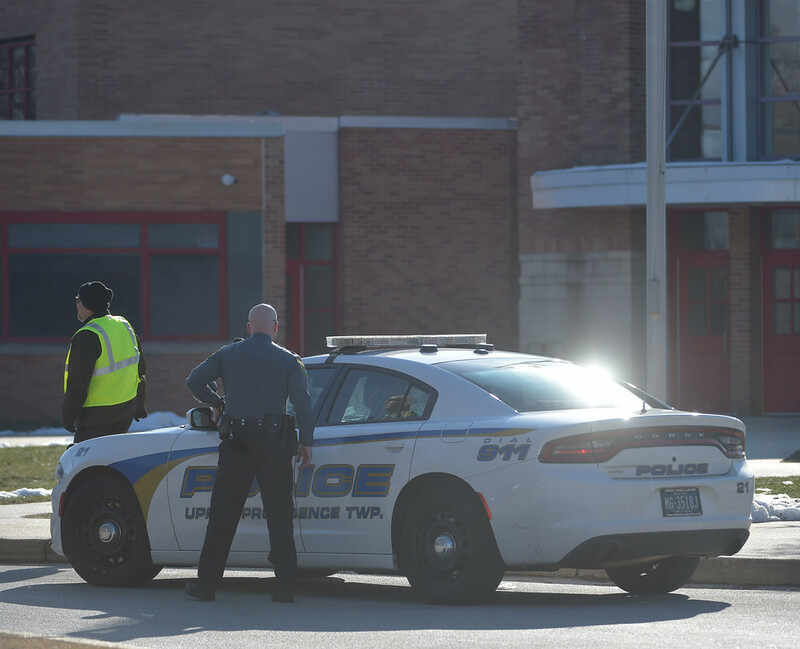 PETE BANNAN-DIGITAL FIRST MEDIA A Upper Providence police officer outside Penncrest High School Wednesday morning. 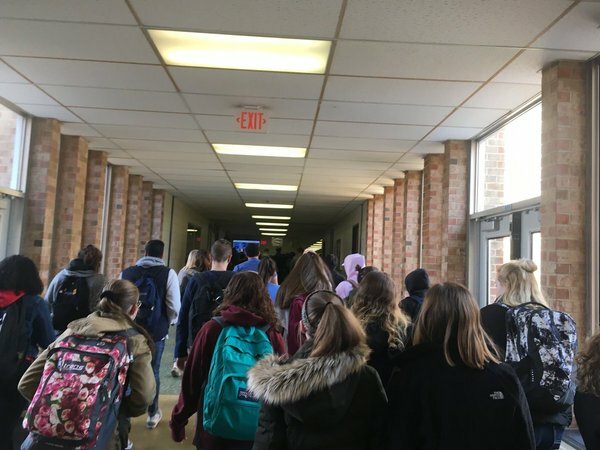 The campus was clsed during the student walkout. 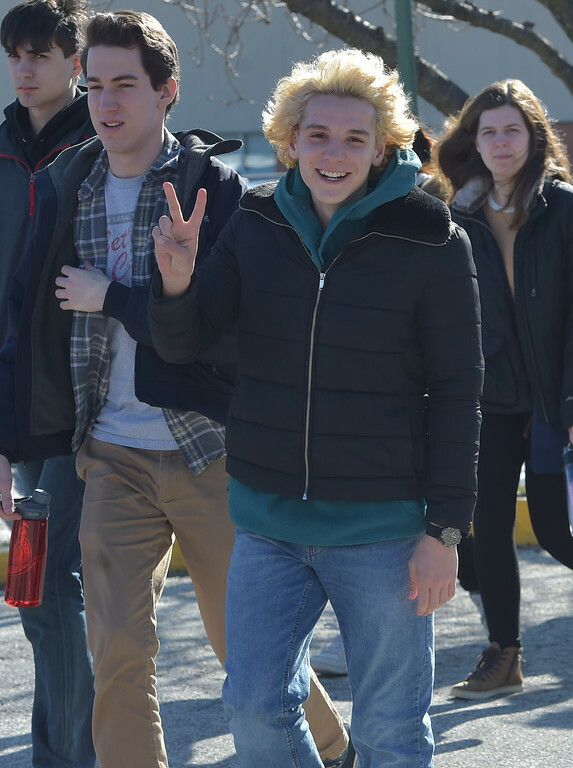 PETE BANNAN-DIGITAL FIRST MEDIA A Haverford High School student holds up the peace sign as he walks out of school to the Student Unity Rally held at Cornog Field Wednesday morning. 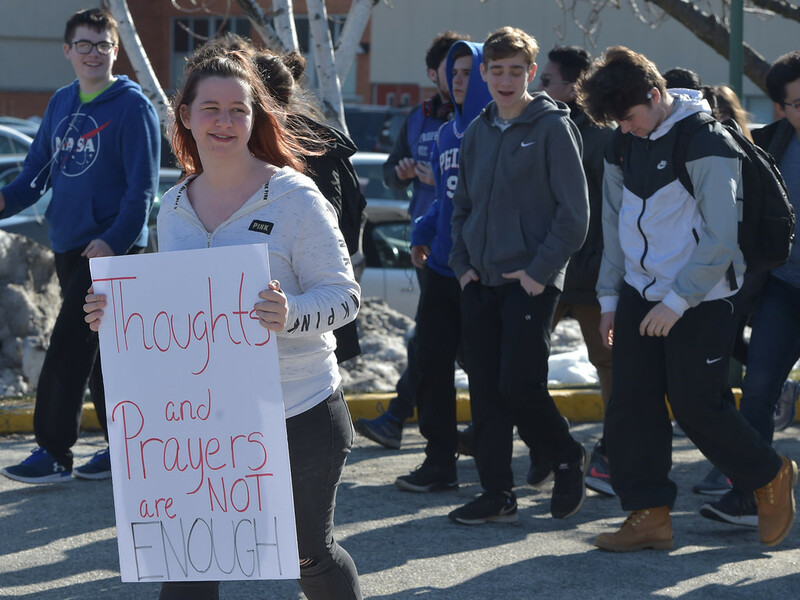 School officials estimated over 900 students took part, they walked around the track 17 times to remember the students killed in the Florida school shooting then held speeches and music before returning to classes. 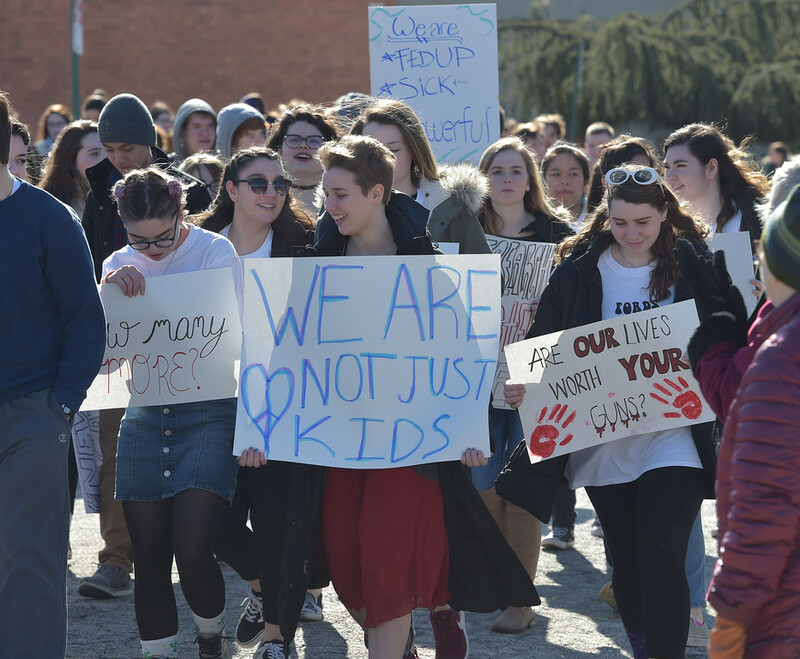 School officials said the students organized everything. 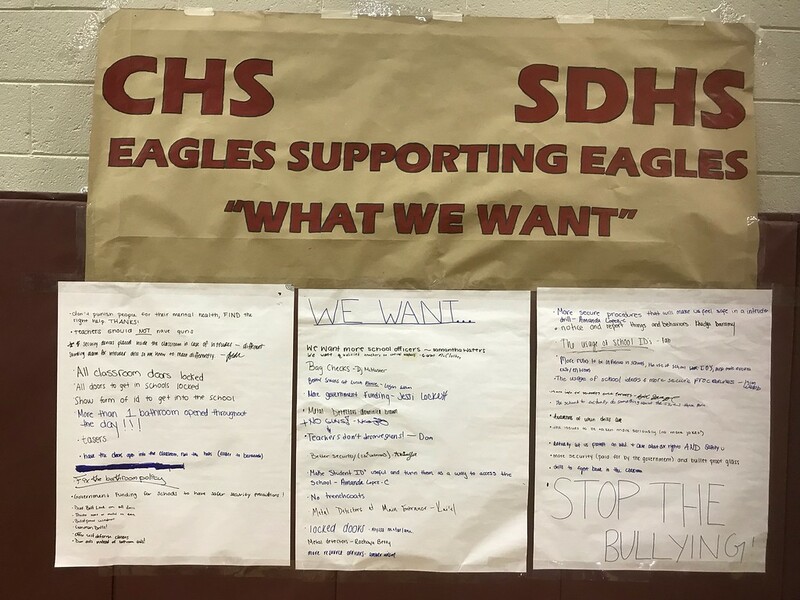 Chichester students created a protest banner. 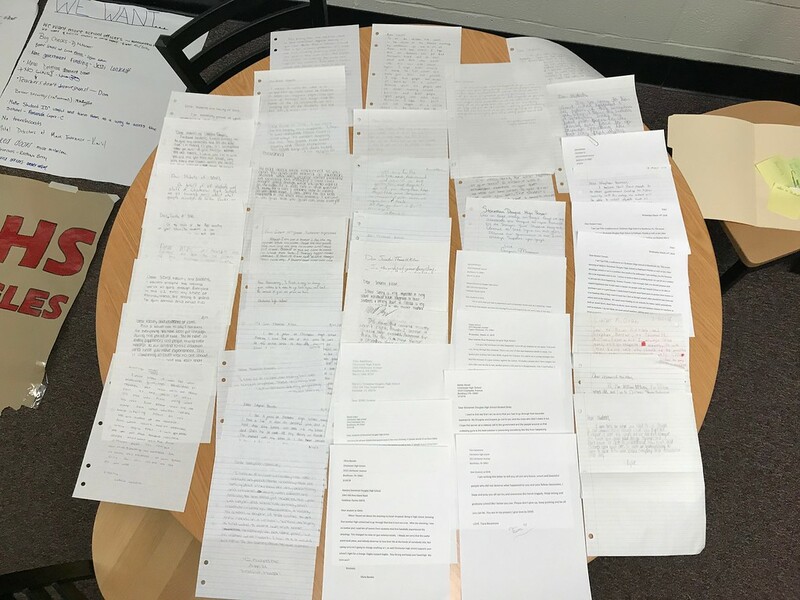 Chichester Students wrote letters of protest. 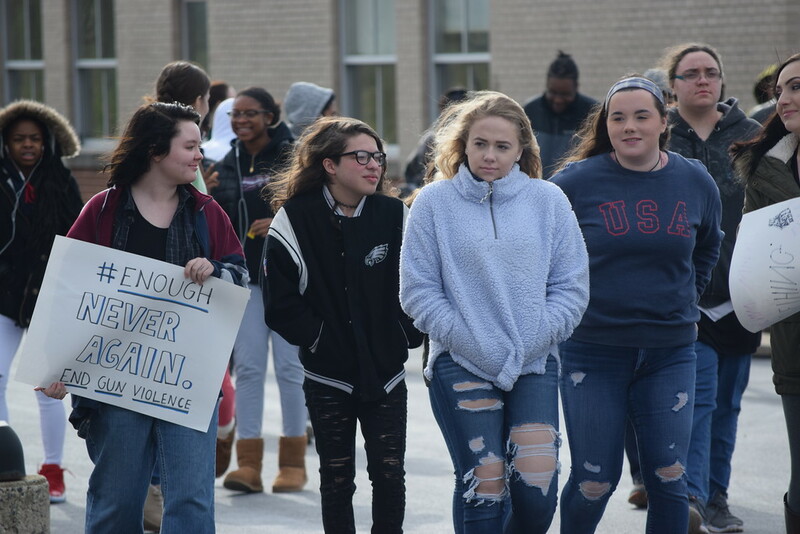 Photo by John J. Armato Students from Pottstown Middle School march to the National Walk-Out event at Pottstown High School Wednesday behind a banner with a simple, but powerful message. 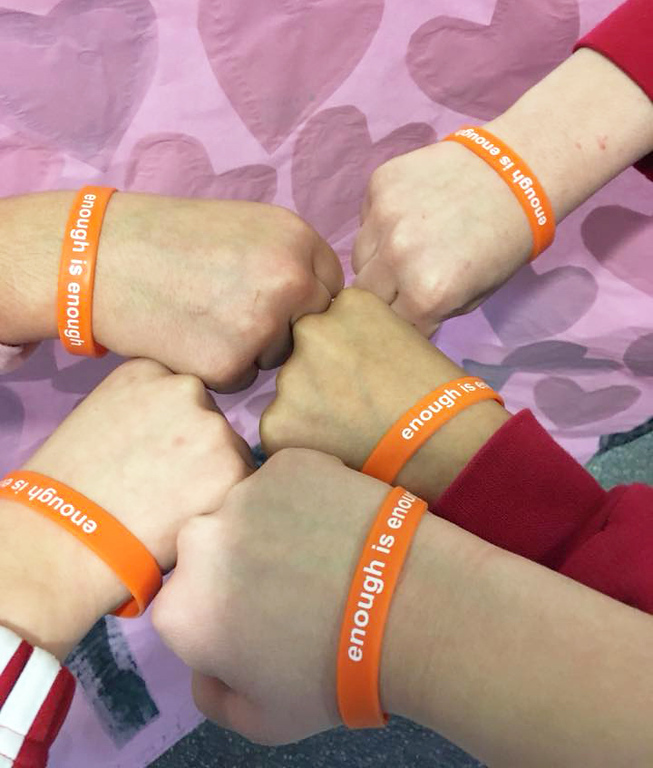 Photo Courtesy of Katie Scanlan Students at Pottstown Middle School wore wrist-bands to get their point across during Wednesday's National Walk-Out protest. 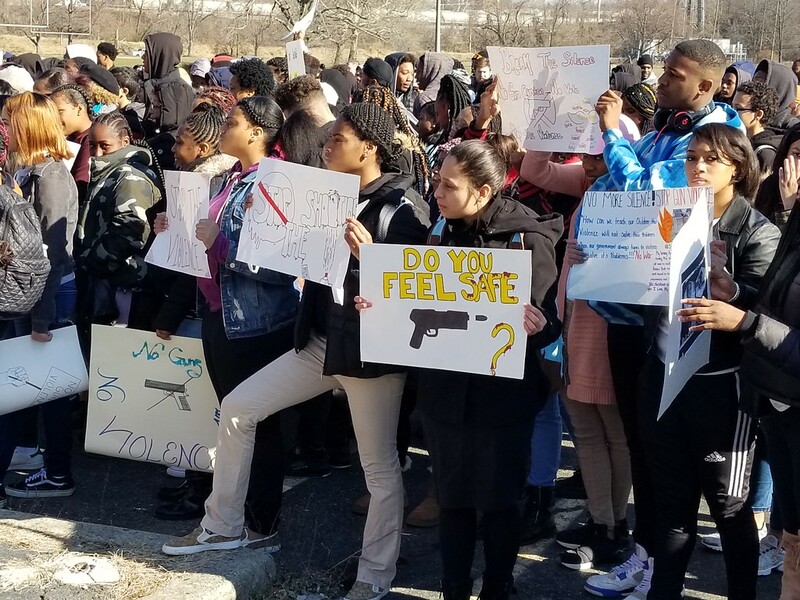 Students walked out of school to protest gun violence.